Then, one day, while exploring the crawl space beneath their cottage, they discover a wooden crate, nailed tightly shut and almost hidden from view. Nothing could have prepared them for the horror of the crate’s contents – or how the peace and tranquility of their lives would be shattered. Deborah Levison joins Burl Barer, Howard Lapides and fact=checker Mark Boyer for almost an hour of fascinating conversation about the book, her life, and the horrors of her family's past. LISTEN LIVE SATURDAY 2PM PACIFIC TIME BY CLICKING THIS LINK, OR LISTEN TO THE PODCAST ON ITUNES OR YOUR FAVORITE PODCAST PLAYER -- EPISODE AVAILABLE BY MONDAY. 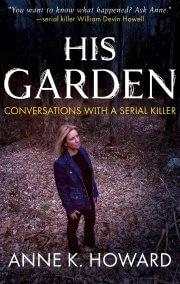 Anne K. Howard Reveals The Confessions of A Serial Killer In HIS GARDEN Saturday 2pm Pacific Time...listen live by clicking this link! LISTEN LIVE BY CLICKING THIS LINK!